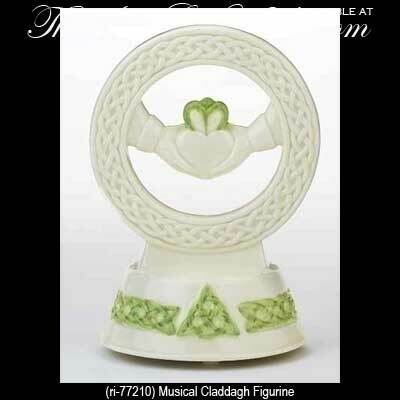 This Claddagh wedding cake topper is white porcelain design that is enhanced with hand painted green accents that include Celtic knots. The Irish wedding cake topper measures 3 3/4" wide at base x 6 1/4" tall; while the Claddagh symbol, that is surrounded with embossed Celtic knot-work, measures 5/8" thick x 4" wide. Wind this musical wedding cake topper to play the melody to When Irish Eyes are Smiling and it is gift boxed with Claddagh and Celtic knot history cards that are complements of The Irish Gift House.